Optics: Nikon Monarch 7 8"x42"
Light: Sunny, bright light, shaded by tree leaves. 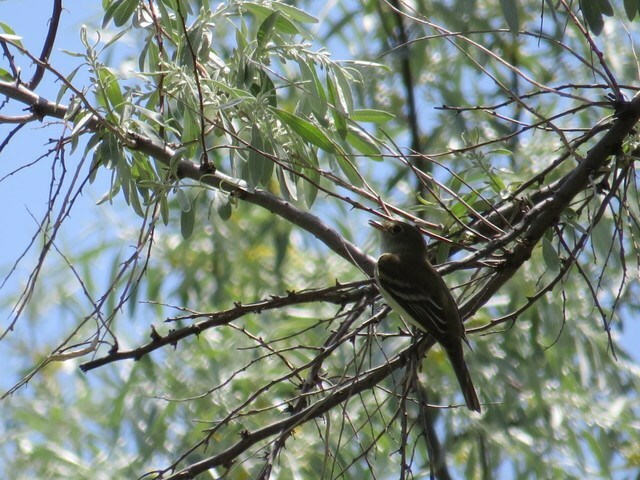 First observed Empidonax type bird flitting about, flycatching from perch in short trees near Arikaree River. Bird had yellowish sides and thin eyering. Bird began to sing distinctive fee BEE o song, repeatedly. Song matched that of Alder Flycatcher after reviewing. I was able to record this song on my camera. Bird continued to move around in one general area, flycatching and singing. I observed it sing the song about a dozen or more times. After reviewing the photos, I observed the thin eyering better as well as the moderate primary projection. The throat to face contrast was very sharp. Also, the bill matched illustrations that I was studying. Pale lower mandible, somewhat wide, moderate length, wedge shape. The bird seemed to stick close to the river and moved from one side to the other, usually in low trees near the river. 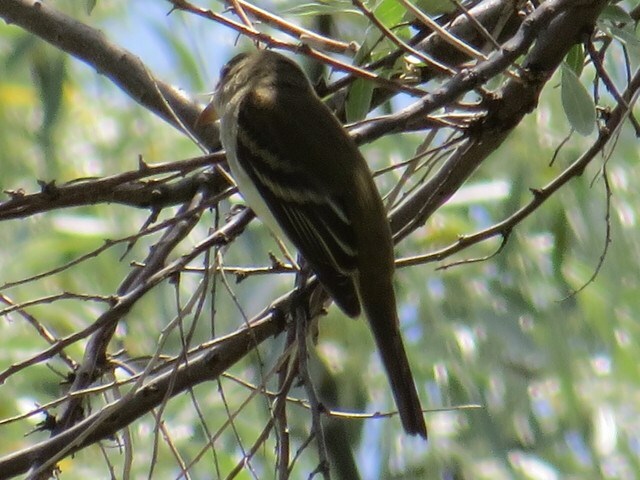 I considered other similiar Empidonax Flycatchers. Dusky and Willow seemed possible. But the fact that the bird was singing so much I thought that with a recording I should be able to figure out which one it was. 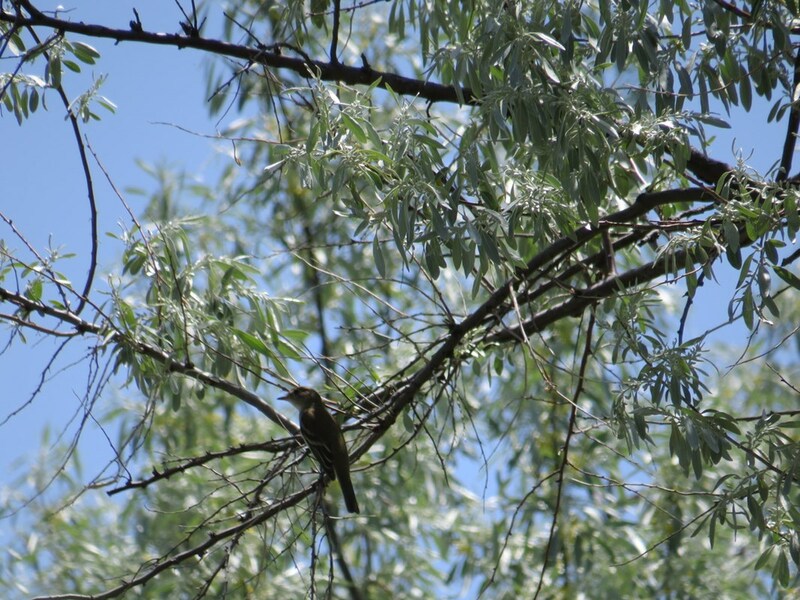 Willow Flycatcher is very similar, but the song is much different. FITZ Bwew. Dusky was considered but the song was completely wrong for Dusky. Dusky would be more jumbled with distinct phrases including pauses. Thin eyering was present, as well as very distinct throat to face contrast. Willow would have less distinct eyering and not as distinct of a throat to face contrast. 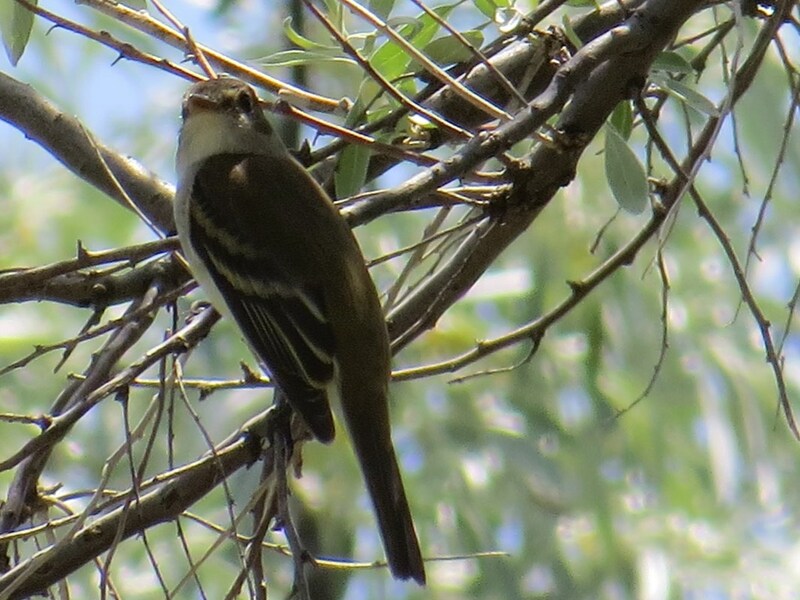 I was also able to compare it to a Willow Flycatcher seen earlier in the day and photographed. The bill and eyering difference pointed to Alder based on the resources consulted. I listened to both songs and compared my recordings. The audio is really what sold me. The other features mentioned all added up to Alder. Nathan Pieplow directed me to the website appliedbioacoustics.com whereby Dr. Archibald McCallum has a comparison study of Willow vs. Alder Flycatcher, including recordings and sonograms. After I submitted my recording to Ebird and analyzed the sonogram it is a match for Alder Flycatcher based on this websites sonogram of Alder Flycatcher. Sibley Second Edition, second printing. National Geographic, sixth edition. Zimmer, second edition Birding in the American West. allaboutbirds.org for sound recordings., appliedbioacoustics.com for sonogram analysis and vocal repertoires of each. Photographs of the bird. Saw one Alder at Flagler, previous year. Identified by Joey Kellner. Have only read and studied pictures and audio recordings from resources mentioned. I have been studying the literature on Empidonax Flycathers, Zimmer and also Kaufman for the last couple of years. I have been trying to photo document all Empids that I see this year, so that I can really study the subtle differences of primary projection, eyering, coloring, bill shape, length and color, head and tail, etc. I have experience with studying the songs and call notes through recordings and sonograms. I am familiar with all three editions of Birding by Ear, the Peterson Guide series, which includes Empidonax recordings. The article and comparison study of Willow vs. Alder Flycatcher by Dr. McCallum on the appliedbioacoustics.com website was very informative during this process. I have experience seeing Least, Willow, Dusky, Hammonds, Cordilleran and a few Gray's. I have also seen Tufted, Yellow-bellied and Buff-breasted, but only once each.